CONGRATULATIONS: My special thanks to Dave Bowlin, Eric S. Brown, & C. Lewis Barr. I appreciate your stories very much and thought all three stories were creative, fun, and worthy of publishing. 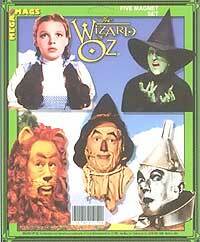 The Winner of the "Brutal Wizard of Oz" contest is: David Bowlin. A Brutal Congratulations Dave! Site designed and maintained by Cutter. For best results, use Internet Explorer 5.x or above at a screen resolution of 800x600.